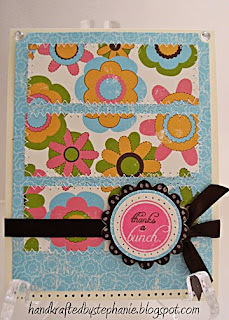 Cardstock: CTMH; Patterned Paper: Making Memories Whimsy; Stamps: PTI; Ink: CTMH, Adirondack Espresso; Punches: SU! Ticket; 1 1/4", 1 3/8" circle; Other: rhinestones, ribbon, paper piercing tool, chipboard scallop circle, white gel pen, dk brown marker, thread. Steph, Love that you turned the sketch. Love the fun paper and your stitching.